For all of the artists whose talent has garnered them fame and fortune, there are countless others who have spent their careers toiling in relative obscurity. 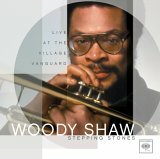 Despite performing with the likes of Art Blakey and Max Roach and earning a reputation among his peers as one of the most respected trumpeters to come into his own during the 1970s, Woody Shaw remains something considerably less than a household name. Given that the basis of his material was a union of the hard bop of the late ’50s with the avant garde movement that dominated the ’60s, it didn’t help that he had reached his pinnacle as a bandleader at a time when the jazz world’s popular sect was focused upon a newfangled strain of music known as fusion. That’s not to say that Shaw shied away from embracing some of the more fashionable textures of his time. In fact, his employment of keyboard player Onaje Allan Gumbs provided a fusion-oriented ambience to numerous moments scattered throughout his stellar 1978 set Stepping Stones: Live at the Village Vanguard. In skipping seamlessly from one style to the next, the title track itself provides a perfect example of this logical extension of the past by effectively demonstrating how one adventurous subset of jazz begat the next.